Will be shown at the “Piston Head II: Artists Engage The Automobile” exhibition in Los Angeles. 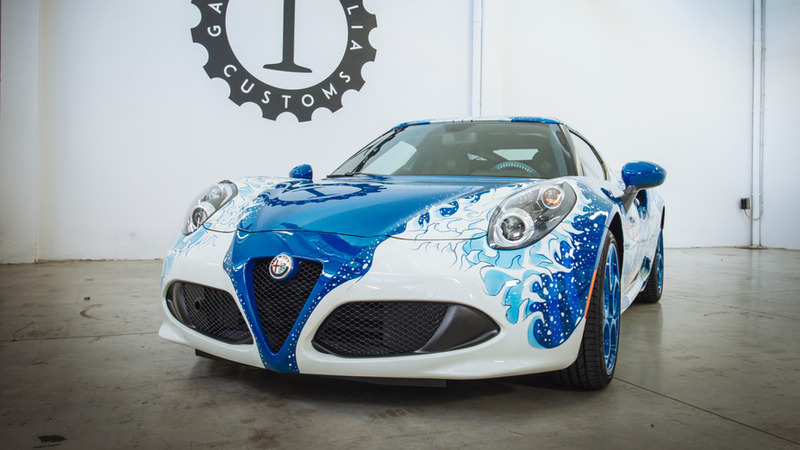 Garage Italia Customs has unveiled a unique Alfa Romeo 4C Coupe called the Hokusai. Set to debut at the “Piston Head II: Artists Engage The Automobile” exhibition in Los Angeles later this month, the one-off model is billed as a celebration of Japanese and Italian cultures. 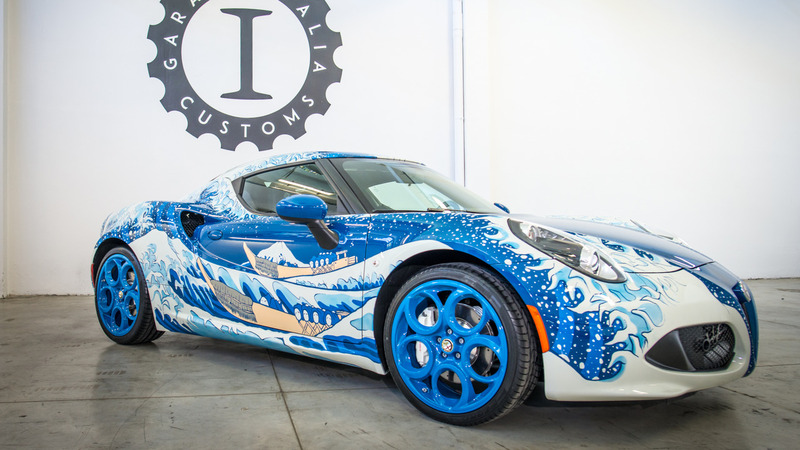 As part of this mashup, the best-known Japanese work in the world - The Great Wave off Kanagawa by Katsushika Hokusai - was air-brushed by hand on the car's bodywork. Garage Italia Customs says the design "immediately recalls the greatness and strength of nature, contrasting the frailty of mankind which is represented by the fishing boats." The car has also been equipped with a unique interior which features Kurabo denim upholstery with cream Foglizzo leather inserts. 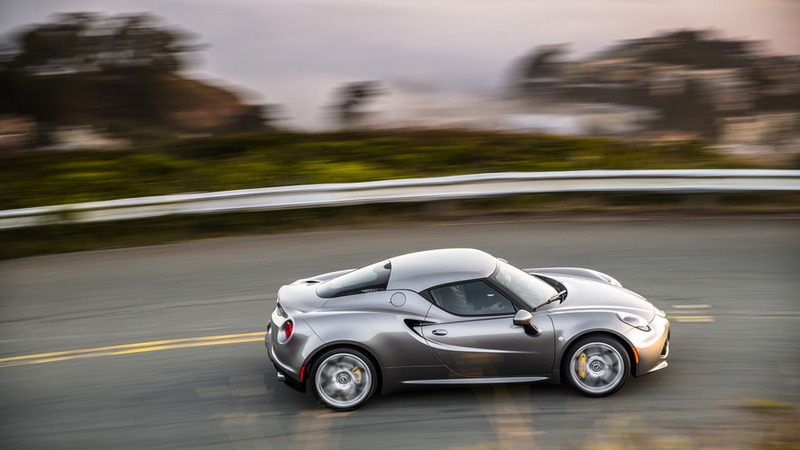 Drivers will also find white contrast stitching as well as white accents on the dashboard and air vents. In a statement, Garage Italia Customs founder Lapo Elkann said “I am happy that Garage Italia Customs and its creations have a role in Venus' exhibition alongside world-class artists. Adam Lindemann and I share a passion for the incredible artistry, beauty and power of the automobile." Besides introducing the Alfa Romeo 4C Hokusai, Garage Italia Customs will showcase the BMW i8 Futurism Edition which was originally unveiled in May. It pays tribute to BMW's 50th anniversary in Italy and features unique styling inside and out. will be held at Los Angeles Venus Gallery (30th July – 10 september). on December 8th 2013, are transformed into sculptures by modern and contemporary artists. the second edition, taking place next July 30th. Gallery, has been his friend for a long time and they share the great passion for art and cars. BMW i8 Futurism Edition, unveiled in Italy last may. of wrapping the Katana hilt (Tsukamaki). the concept underlying i8 and the whole BMW i philosophy. art “Street Light”, from 1909, thus became the starting point for the creation of a tailor-made film which was applied on all the BMW i8 bodywork using the wrapping technique. The painting represents an electric lamppost in a moon-lit night. Its light seems to almost materialize due to the sharp and fragmented pure colours in the painting. This is how the artist celebrates technological revolution and the beginning of electric energy. reality yet to be discovered. From that moment on, nights have been illuminated by street light. Solaro, a fabric that is used for suits.